Black Rain is the tenth studio album by British heavy metal vocalist Ozzy Osbourne, released 22 May 2007 on Epic Records. It is Ozzy's last album to feature Zakk Wylde and Mike Bordin, and the first to feature bassist Rob Nicholson. Black Rain debuted at No. 3 on the US Billboard 200, selling about 152,000 copies in its first week; making it Osbourne's highest debut to date. As of 29 September 2007, the album had sold 406,053 copies in the US, and had been certified Gold. The album was released in several different versions. 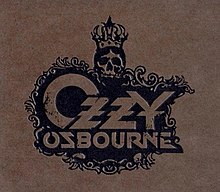 The original US version was released in a thin, brown digipak with the crowned skull Ozzy Osbourne logo (pictured lower right), and for the rest of the world, it was released in a standard jewel case featuring cover art of Osbourne with 'Black Rain' falling. This cover included a booklet complete with lyrics and album credits. The US version did not include a booklet, lyrics, or album credits. The Japanese release was the same as the other releases outside of the US, except for the fact that it included two bonus tracks, "I Can't Save You," and "Nightmare". The iTunes release of the album included the aforementioned "Nightmare", plus an exclusive bonus track, (only for those who preordered through iTunes) "Love to Hate". It also included a printable pdf file of the booklet, complete with lyrics and album credits. This same booklet was later made available as a free pdf download from Osbourne's website on 1 June. The song "I Don't Wanna Stop" was also featured as the theme song for WWE Judgment Day 2007. In the US, limited edition copies of the album were sold with special codes inside of the packets, which could be used to redeem a pair of OzzFest 2007 tickets. OzzFest 2007 was nicknamed "Freefest" because all tickets were free. The album was reissued in the US on 14 August in a new jewel-case package containing the full booklet with lyrics and new colour cover art and photos, also containing CD extra bonus content featuring behind-the-scenes footage from the "Black Rain" photo shoot. A "tour edition" version of the album was released on 20 November 2007. This release includes an extra CD with 3 recently recorded live tracks and 3 studio tracks originally available on international releases and/or digital versions. Black Rain received mixed reviews. Rolling Stone referred to the album as "highly skippable" and Sputnikmusic called it "quite embarrassing". AllMusic was somewhat less harsh in its assessment, giving the album 3.5 out of 5 stars while noting that "Nothing on Black Rain could really qualify as an Osbourne classic." WWE used "I Don't Wanna Stop" at the official theme song to the 2007 PPV Judgment Day. Osbourne later performed the song live on the May 18, 2007 edition of WWE Friday Night SmackDown. Osbourne performed on Jimmy Kimmel Live! on 21 May and 22 May. Osbourne appeared on BBC1's Friday Night with Jonathan Ross on 25 May 2007 and performed "I Don't Wanna Stop". Osbourne performed "Not Going Away" on Spike's Scream Award Ceremony. The song "I Don't Wanna Stop" is featured in the video games Guitar Hero: On Tour and Madden NFL 08 It is also featured as DLC for Rock Band and Rock Band 2 in the Ozzy Osbourne Pack 01. Ozzy himself appeared in the video games Brütal Legend and Guitar Hero World Tour. "I Don't Wanna Stop" is used as the opening bumper music on the Boomer and Gio morning drive sports-talk program on WFAN. ^ a b c "Black Rain Billboard Albums". AllMusic. All Media Network. Retrieved 17 December 2015. ^ a b "RIAA Gold & Platinum database". Retrieved 17 February 2009. ^ a b Erlewine, Stephen Thomas. "Ozzy Osbourne - Black Rain review". AllMusic. All Media Network. Retrieved 13 December 2015. ^ Kaye, Don. "Ozzy Osbourne - "Black Rain"". Blabbermouth.net. Retrieved 13 December 2015. ^ Vozick-Levinson, Simon (18 May 2007). "Black Rain". Entertainment Weekly. Retrieved 13 December 2015. ^ a b Greene, Andy (25 May 2007). 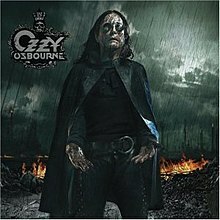 "Album Reviews: Ozzy Osbourne - Black Rain". Rolling Stone. Archived from the original on 18 May 2007. Retrieved 13 December 2015. ^ a b Stagno, Mike (22 May 2007). "Ozzy Osbourne - Black Rain". Sputnikmusic. Retrieved 13 December 2015. ^ Marszalek, Julian (21 May 2007). "Ozzy Osbourne - 'Black Rain'". Yahoo! Music. Archived from the original on 27 May 2007. Retrieved 13 December 2015. ^ "Ozzy Osbourne – Black Rain (Album)". Swedishcharts.com. Media Control Charts. Retrieved 17 December 2015. ^ "Ozzy Osbourne – Black Rain (Album)". Finnishcharts.com. Media Control Charts. Retrieved 17 December 2015. ^ "Ozzy Osbourne – Black Rain (Album)". Norwegiancharts.com. Media Control Charts. Retrieved 17 December 2015. ^ "Ozzy Osbourne – Black Rain (Album)". Danishcharts.com. Media Control Charts. Retrieved 17 December 2015. ^ "Ozzy Osbourne – Black Rain". Austriancharts.at (in German). Media Control Charts. Retrieved 17 December 2015. ^ "Ozzy Osbourne Official Charts". Official Charts Company. Retrieved 25 October 2015. ^ "Album – Ozzy Osbourne, Black Rain". Charts.de (in German). Media Control Charts. Retrieved 17 November 2015. ^ "Ozzy Osbourne – Black Rain (Album)". Charts.org.nz. Media Control Charts. Retrieved 17 December 2015. ^ "ブラック・レイン オジー・オズボーン" (in Japanese). Oricon. Retrieved 20 December 2015. ^ "Ozzy Osbourne – Black Rain (Album)". Italiancharts.com. Media Control Charts. Retrieved 17 December 2015. ^ "Oficjalna lista sprzedaży :: OLiS – Official Retail Sales Chart". OLiS. 21 May 2007. Retrieved 17 December 2015. ^ "Ozzy Osbourne – Black Rain". Hitparade.ch (in German). Media Control Charts. Retrieved 17 December 2015. ^ "Ozzy Osbourne – Black Rain (Album)". Australian-Charts.com. Media Control Charts. Retrieved 17 December 2015. ^ "Ozzy Osbourne – Black Rain". Dutchcharts.nl (in Dutch). Media Control Charts. Retrieved 17 December 2015. ^ "Ozzy Osbourne – Black Rain (Album)". Spanishcharts.com. Media Control Charts. Retrieved 17 December 2015. ^ "Ozzy Osbourne – Black Rain". Ultratop (in French). Media Control Charts. Retrieved 17 December 2015. ^ "Ozzy Osbourne – Black Rain". Ultratop (in Dutch). Media Control Charts. Retrieved 17 December 2015. ^ "Ozzy Osbourne – Black Rain (Album)". Lescharts.com (in French). Media Control Charts. Retrieved 17 December 2015. ^ a b c d e f g "Black Rain Billboard Singles". AllMusic. All Media Network. Retrieved 17 December 2015. ^ "Ozzy Osbourne – I Don't Wanna Stop (Song)". Swedishcharts.com. Media Control Charts. Retrieved 17 December 2015. This page was last edited on 11 January 2019, at 01:31 (UTC).